All events organized by Dharma Wheels Foundation are offered freely and supported entirely through the efforts of volunteers and your donations of funds, food, and supplies. All financial contributions beyond event costs are offered to our host centers. Since our first Buddhist Bicycle Pilgrimage in 2002, we have dispersed thousands of dollars to the many Buddhist centers and monasteries we’ve visited. Below, you can read more about some of the special projects we have supported. Click here to donate online with a debit card, credit card, or PayPal account. If you prefer to donate by check, please mail it to: Dharmawheels Foundation, 4238 Rickeys Way, Unit J, Palo Alto, CA 94306. Dharmawheels Foundation is a nonprofit 501(c)(3) tax-exempt organization, Federal Identification Number 75-1664779. Donations are tax deductible to the extent allowed by law. You will receive a receipt that acknowledges your donation. Your contact information will remain confidential and will not be shared with others. Abhayagiri Monastery – Last year, the October 2017 Redwood Valley fire nearly consumed Abhayagiri —fortunately, all the structures survived. In the aftermath of the devastation on adjacent properties, the monks expanded their fire safety measures: cutting/clearing brush, widening trails to improve firefighter access, and enlarging the defensible space around the many kutis (cabins) scattered throughout the forest. DharmaWheels donations in 2018 will support ongoing maintenance and improvements to these fire safety measures. The Abhayagiri community hopes that by caring in this way for the monastery and its forest, they might honor the generosity and faith that have created Abhayagiri as a refuge for all who wish to spend time there and devote themselves to the Buddha’s path of liberation. Sae Taw Win II – Dr. Thynn is in the process to constructing a scaled model of the Shwedagon Pagoda (Yangon, Burma) and is working hard to complete the project. Also the center is always looking for operating expenses. DharmaWheels hopes to aid both efforts. 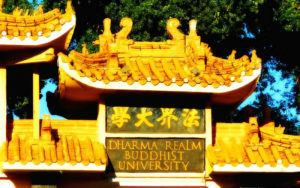 City of Ten Thousand Buddhas – DharmaWheels will contribute to Dharma Buddhist University. Instilling Goodness Elementary School and Developing Virtue Secondary School merge the best of contemporary and traditional methods and of Western and Eastern cultures. 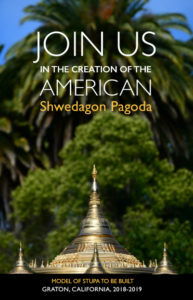 Due to the emphasis on moral virtue and spiritual development, in addition to the required academic curriculum, courses are offered in ethics, meditation, Buddhist studies, and so on, giving students a foundation in virtue and guiding them gradually to know themselves and to explore the truths of the universe. 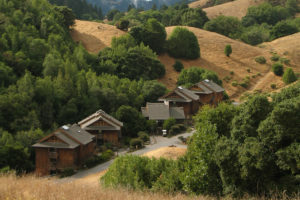 Spirit Rock – After more than 25 years, Spirit Rock has established an international reputation as a center for Dharma in the West. Situated on 412 acres of spectacular terrain, the center has outgrown the original buildings and is reconstructing with a long-term vision. 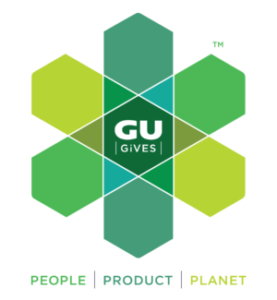 DharmaWheels will support this effort with a donation to the General Fund. Two Rock Church – For many years this Christian Presbyterian church has donated access for a DharmaWheels rest stop, asking nothing in return. This is a congregation that values service. Its members actively support the work of the Cents-Ability Hunger Program of the Presbyterian Church (USA), the Two Rock School, the Two Rock Volunteer Fire Department, Petaluma People Services and Christmas Cheer. A donation from DharmaWheels will aid their efforts. Currently the ABS Temple operates in two small old buildings, main House (1,300 Sq. 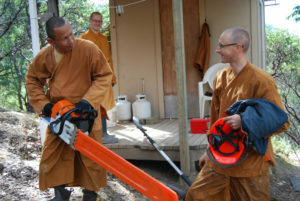 ft) is used for Monks’ living area and many other activities/services and the other building (783 Sq. ft) next to the main house is used as Buddha/Meditation Hall. 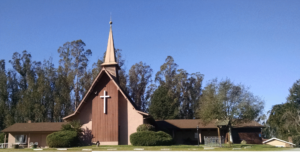 However, ABS Temple provides many services for various communities in Northern California with immense difficulties due to limitations in space and facilities. Some of these services include meditation classes/retreats, Dhamma talks, Dhamma classes, Sunday school, family services, spiritual counseling sessions, major religious services. Their goal is to build a new facility to improve current services, provide additional services and to accommodate the growing communities. The new building consists of Buddha hall/meditation hall, class rooms, multi-purpose hall, reception/lobby, kitchen, public rest rooms, verandah on the first floor (7,358 Sq. ft) and monks’ residence on the second floor (1,858 Sq. ft). There are 35 parking spaces associated with the temple to meet the requirements of the City. 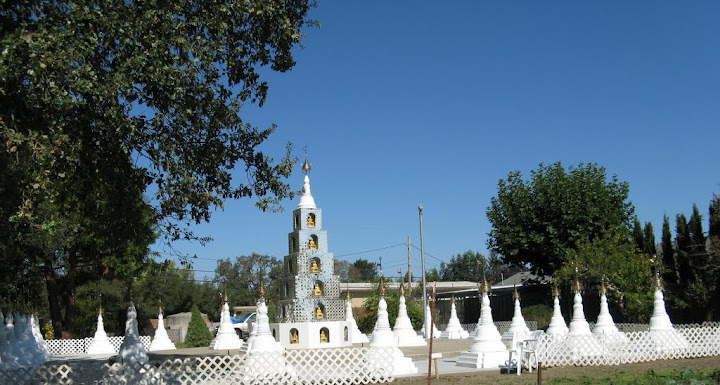 Dieu Nhan (Wonderous Cause) Zen Convent is located in Northern California. The benefactor’s family (Luc Hoa): Mān Tù Tri, Mãn Tù Huê and other siblings donated the homes and land area of nearly 11 acres located on the hill to Zen Master Thich Thanh Tu. With the Master’s approval and directives this place was established into Dieu Nhan Buddhist Meditation Association Inc., under the management of View Chieu Zen Monastery (in Vietnam) on July 4, 2002. Four months later, the Master came to perform the stone laying ceremony and started the building of the Meditation Hall on November 16, 2002. At first the monastery consisted of a house and a car. Until now, the place is renovated into a spacious hall which can accommodate up to 60 Zen practitioners to practice sitting meditation. 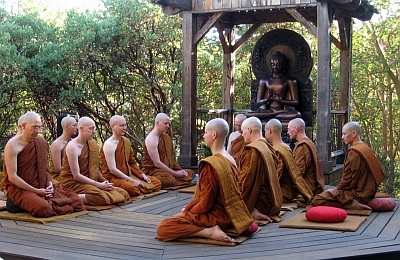 The Aloka Vihara sisters are a community of bhikkhunis (fully-ordained nuns) dedicated to practicing the Buddha’s teaching in the style of the Theravada Forest Tradition. Their practice emphasizes simplicity, renunciation, service and an orientation towards learning from the natural world – all held within the context of the Buddha’s teaching. The sisters are embracing and integrating the realities and challenges of contemporary society into their practice. Their focus now is on renovating the nuns’ living quarters to allow the resident community to grow and flourish. Bringing existing house up to code. Thank you to these generous companies for donating supplies to past Dharma Wheels events.